Page 4 His story is much like that of thousands of Mexicans who came to this country and found hard back-breaking work in steel mills on railroads, grey iron foundries and as field hands harvesting crops in the vast farmlands of the Southwest, West and Midwest. Their strong desire to care for their families and control their own destiny make them some of the most reliable workers in this country. 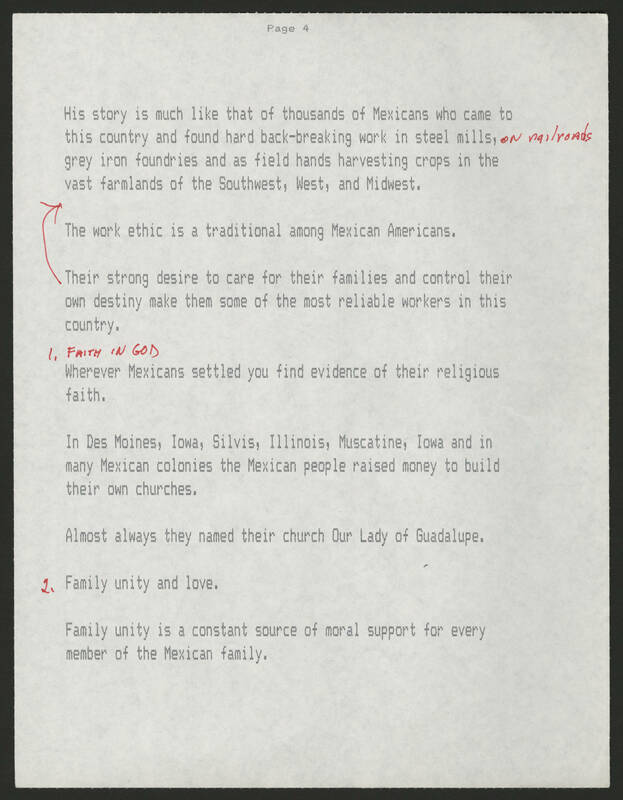 The work ethic is a traditional among Mexican Americans. 1. Faith in God Wherever Mexican settled you find evidence of their religious faith. In Des Moines, Iowa, Silvis, Illinois, Muscatine, Iowa and in many Mexican colonies the Mexican people raised money to build their own churches. Almost always they named their church Our Lady of Guadalupe. 2. Family unity and love. Family unity is a constant source of moral support for every member of the Mexican family.